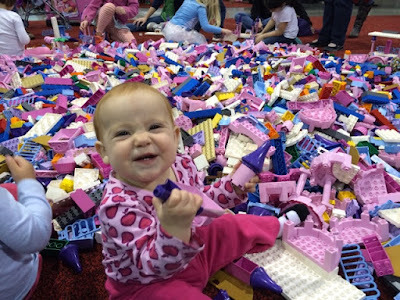 My kids got to wade into a sea of LEGO's at LEGO KidsFest that rolled through Charlotte this past weekend. 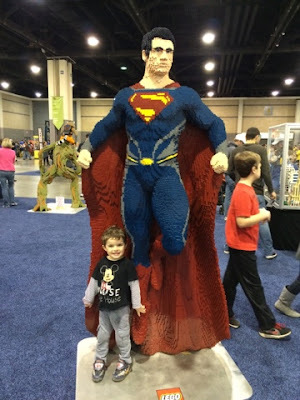 We weren't sure what to expect at the convention center, but my youngest two (my oldest was out of town) really enjoyed all that LEGO KidsFest had to offer. I loved that they had LEGOs perfect for every age, from large Duplos that little bits (almost 1 year old now!) enjoyed moving from place to place, to LEGO Juniors that were right up the alley for my 3 year old's interests and building capability. 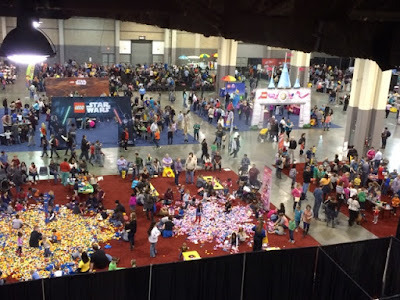 For the older kids they had every type of LEGO you could imagine, Princess, Fairy, Star Wars in addition to battle zones where families competed to win LEGO prizes. 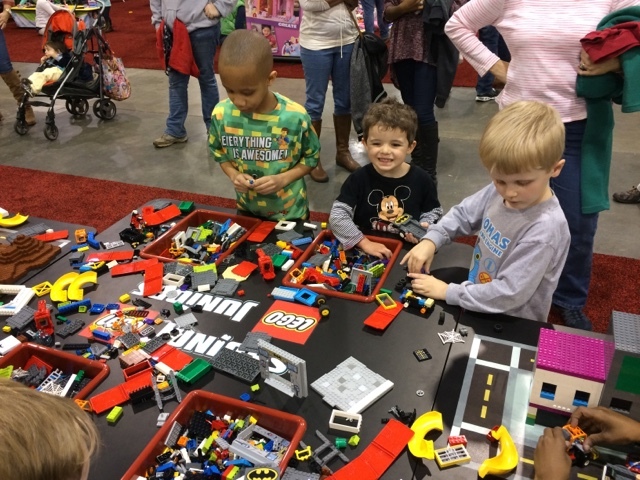 The older kids could enjoy Master Builder sessions where they could hone their creativity and building techniques. Our kids moved from booth to booth and loved posing with the giant LEGO creations. My husband and I were particularly impressed with Super Man's multi-dimensional cape. My younger two were a little young to enjoy all the booths that were available, but we participated in the creation nation where E made a LEGO creation to be included in the US map and received a LEGO Builder gift for participating. He also got artsy in the Art Gallery which housed participants LEGO arts of work on large canvas like displays. 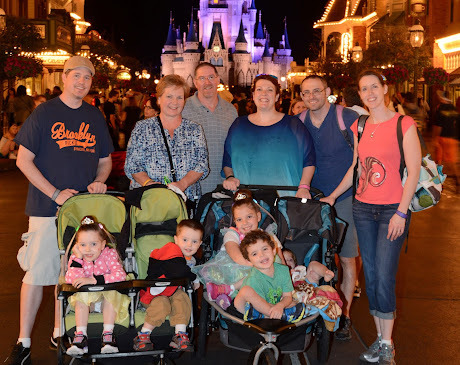 We wore little bits in a carrier, but many people had strollers and it seemed maneuverable. I packed water bottles for the family, which was a good move because it was very dry in the convention center. I also brought snacks because it was right during dinner and my kids are picky eaters. My kids couldn't participate in every activity, although the older kid events looked like SO much fun. I think the best age for the festival would be 6-14. As a child I was always a LEGO enthusiast, and this type of festival would have blown. my. mind. If LEGO KidsFest is coming to your city, it's a must experience. 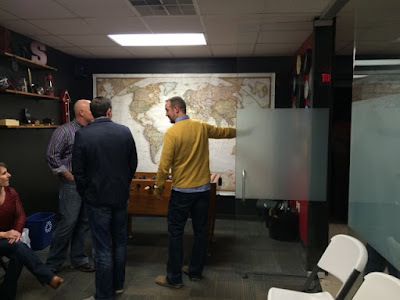 But buy quickly, because all 3 sessions in Charlotte sold out two weeks prior to the event. 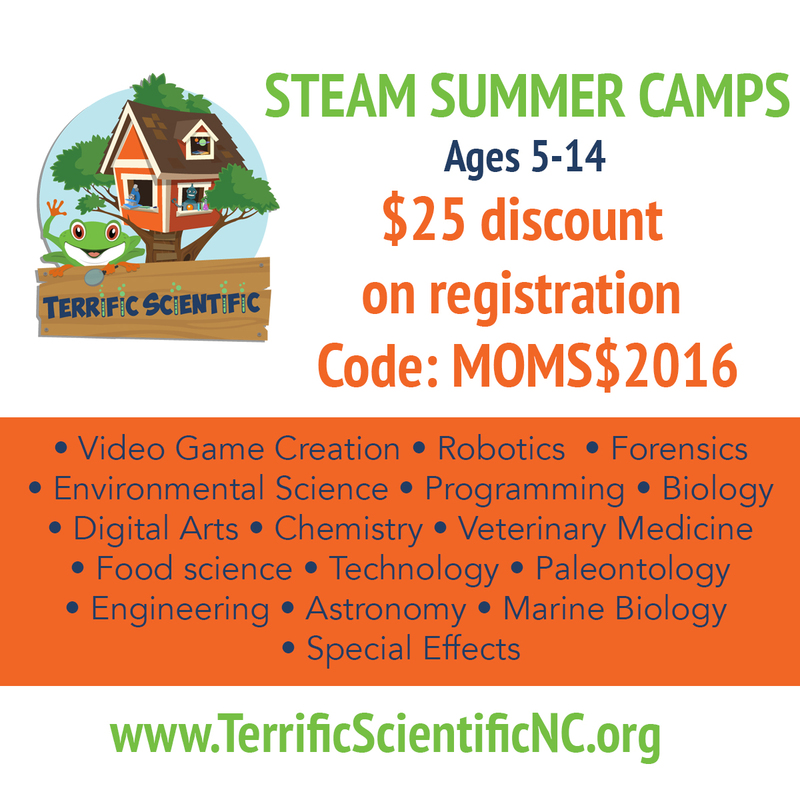 We've been enjoying the STEAM (Science Technology Engineering Arts and Math) summer camps that Terrific Scientific Summer Camps offer for two years. Our daughter eagerly anticipates this summer camp each year. You can read about our daughters weeks learning and exploring with Terrific Scientific here and here. Right now they are offering a $25 discount with the code MOMS$2016. This year they are offering 35 summer camps including: Environmental science, programming, digital arts, chemistry, biology, veterinary medicine, robotics, forensics, video game creation, food science, technology, paleontology, engineering, astronomy, marine biology and special effects. 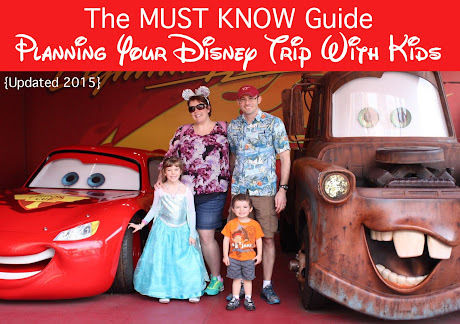 Follow this link and sign your little ones up for an amazing summer time experience. Known for his dynamic live show, six-time GRAMMY® winner TOBYMAC and K-LOVE/AIR1 are presenting the talent-packed, multi-artist HITS DEEP TOUR. Leading the nationwide run alongside his DiverseCity Band, the multi-platinum selling artist will be joined by Britt Nicole, Colton Dixon, Building 429, Capital Kings, Finding Favour and Hollyn, promising a night of non-stop hit songs. The tour’s theme and multi-artist package will undoubtedly make for some special moments on stage. “This tour is going to be exactly what most people want to see when they go to a concert – a show where you know every song,” said TobyMac. “Big hits that hit deep! Not just hits because they are sonically a good listen, but because they’ve spoken deeply to our souls. Tickets are on sale now - click here! Win 2 tickets to the show on 2/20/16 at 7PM at the Time Warner Cable Arena by sharing this post on Facebook publicly (click on that link, you'll need to make sure you change the privacy setting to public so I can see that you've shared) and by tagging 2 friends in the post on Facebook who you think love TobyMac! One entry per share/tag per day. Winner randomly drawn on 2/18. 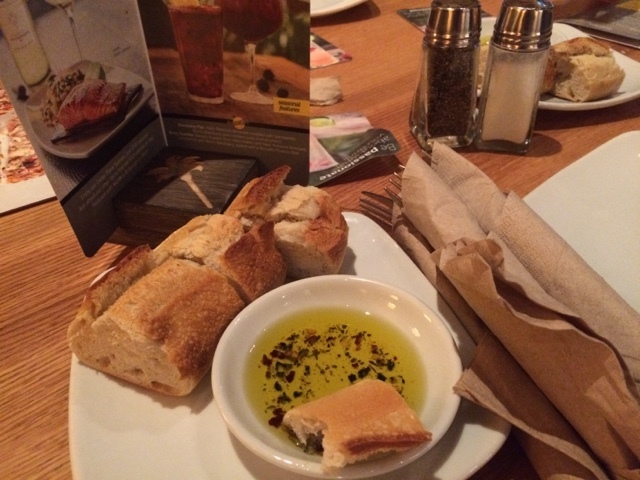 We enjoyed a taste of the West Coast for dinner last Friday at California Pizza Kitchen (CPK) at the South Park Mall in Charlotte. They're one of the CPK locations to feature new next chapter menu items. These selection make CPK a dining experience more than just pizza. They still have their go-to favorites, but the taste and quality of their new expanded menu has placed CPK on our list of core restaurants. Their new main plates offer creations for every taste, including hearth-roasted halibut and fire-grilled ribeye. They have incorporated a seasonally inspired rotating menu that featured roasted garlic chicken and seasonal vegetables, harvest kale salad and a brunch-gone-wild sunny side up bacon and potato pizza. We had some tough decisions to make as we poured over the new menu. It had been a long week, so I was hoping for something to momentarily transport me somewhere relaxing and tropical. 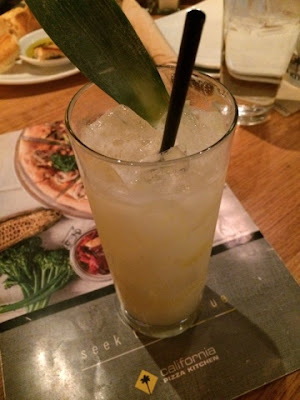 Our fabulous waitress suggested the coconut blossom cocktail, a refreshing pineapple and coconut libation that conjured palm trees in my mind - the perfect choice. My husband opted to stay more local and selected a craft brew, Jam Session, from NODA Brewery. We were torn on appetizers between their smoked ham and swiss flat bread with emmentaler (cheese), goat cheese and caramelized onions topped with smashed garlic croutons or their house favorite, the avocado club egg rolls. 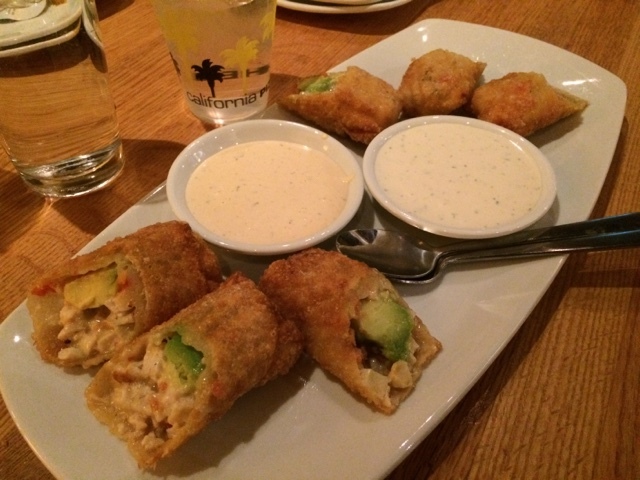 We went with the avocado club egg rolls, which are freshly hand-wrapped wonton rolls filled with avocado, chicken tomato, Montery Jack and Nueske's applewood smoked bacon and served with ranchito and herb ranch dipping sauces. These are easily my new food-obsession. We wanted to try one of their new crisp salads in addition to an entree so we opted to split their harvest kale salad. 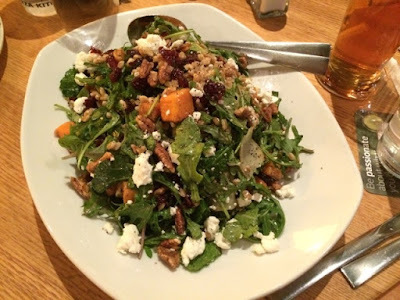 It had baby kale, toasted farro (a grain), roasted butternut squash, Napa cabbage, shaved pear, marinated cranberries, spiced pecans and goat cheese all tossed with a housemaid citrus vinaigrette. I enjoyed the unique combination of tastes and textures of the salad, and it was healthy while actually being tasty. A major win-win. For our main plate I waffled between the hearth-roasted halibut, roasted on a cedar plan with grilled asparagus and butternut squash farrow & baby kale and their sunny side up bacon and potato pizza. 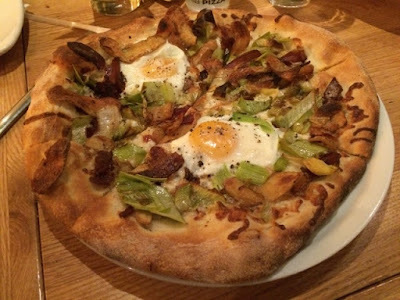 Ultimately I decided that I couldn't pass up trying their brunch-tactic pizza that incorporated shaved fingerling potatoes, Nueske's apple smoked bacon, caramelized leeks, parmesan, mozzarella and fresh cracked black pepper topped with two sunny-side up eggs. It was a vision, and totally fulfilled my brunchy desires. Our (super picky) son thought it was so funny to have an egg on a pizza that he tried a bite. 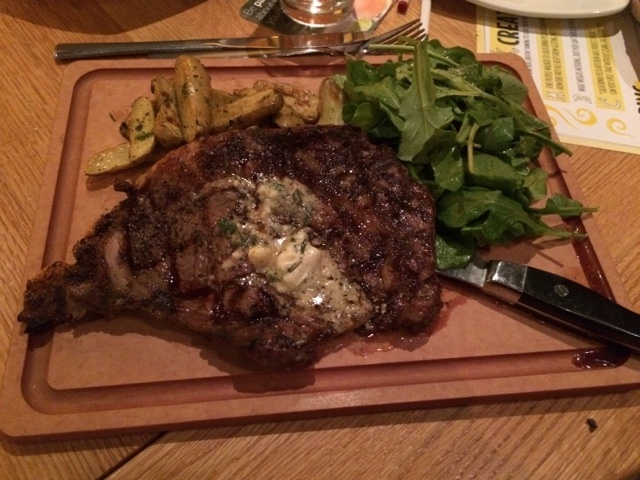 My husband was in the mood for a steak and selected their fire-grilled ribeye, which is 12oz USDA choice ribeye grilled with housemade Pinot Noir, sea salt and topped with creamy bleu cheese butter accompanied by fingerling potatoes and a lemon-garlic wild arugula salad. We shared our entrees, so I am able to attest to how juicy and tender their ribeye was, it was so tender we could share it with our 11 month old who loves herself some table food. In addition to food that is adult-friendly they also had MANY selections for our 3 year old son. I love when a kids menu offers lots of options, they had grilled chicken breast, crispy chicken, curly mac'n'cheese, fusilli with meat sauce, buttered fusilli, fusilli with tomato sauce, fusilli alfredo, CPK salad, BBQ chicken pizza, mushroom pepperoni sausage pizza, hawaiian pizza, traditional cheese pizza and pepperoni pizza. Plus they offered fresh fruit. Bestill my mommy heart - there were so many options he actually eats - avoiding a melt down over a lack of food option is the mic-drop at dinner. In the end he chose the traditional route with a cheese pizza and ate every. last. bite. He's such an imp! Mama - you've worked hard all week - enjoy dinner tonight at the California Pizza Kitchen. You can enjoy some of the fresh new options on CPK's menu after you do some window shopping letting the kids burn off some energy in the process. By the by, CPK is perfectly placed next to the South Park Mall's new ship play area you can see here. CPK also has a covered outdoor patio for when the weather warms up. A CPK Kids Meal (did you see all the options above!?) and refillable souvenir drink. If they choose a pizza they get to make it and watch it bake in the giant oven. 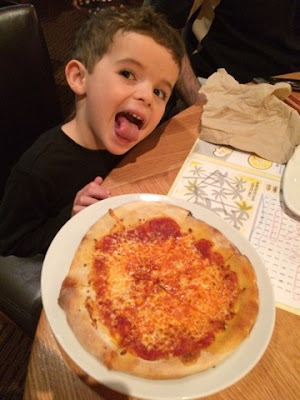 CPK Kids "Adventures in Pizza" restaurant tour. CPK Kids activity book and crayons. Certificate for a free CPK Kids Meal for their next visit. The birthday kid gets a free CPKids chef jacket, and a free CPK Kids Meal, drink and dessert. You can bring your own cake, best for kids ages under 10 years and max of 15 kids. You can book your birthday party, kids day out or just because party by calling 704-364-6280 or email r_spc@cpk.com. CPK treated our family to dinner, but as always my opinions are my own. I only share what I love with readers - and how the heck can you go wrong with egg on a pizza? 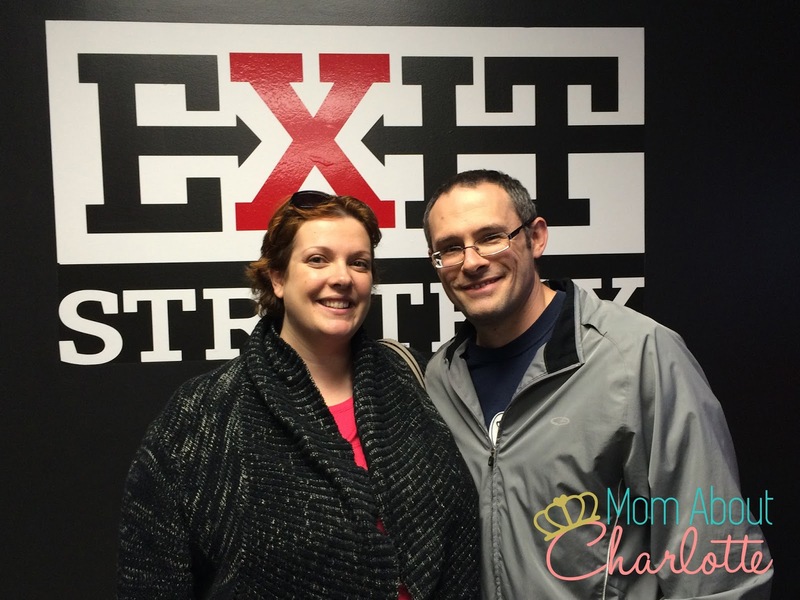 tasty dinners, second date nights worth paying the baby sitter for. 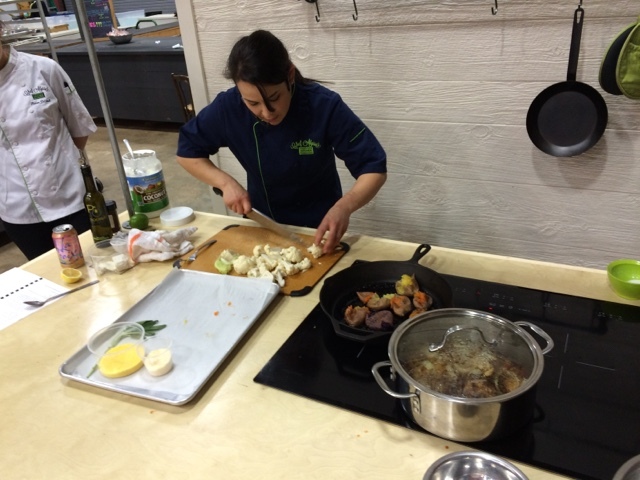 Enter Chef Alyssa's Kitchen in Atherton Mills Market. 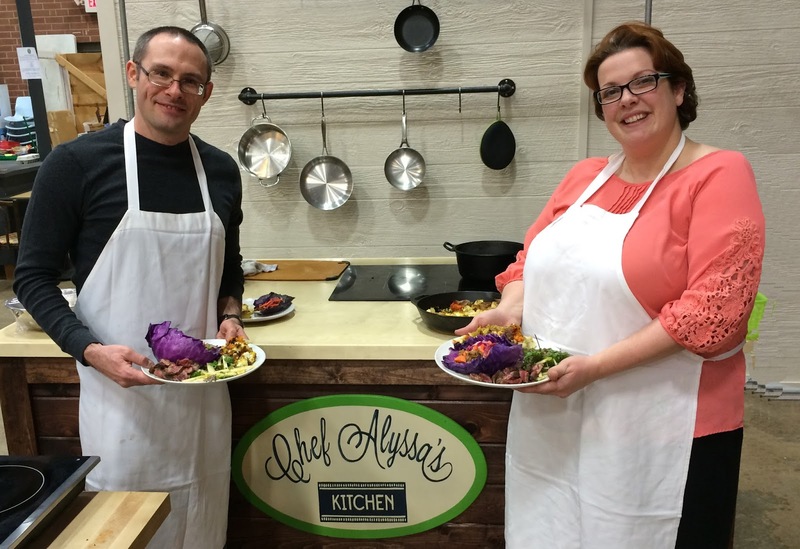 Chef Alyssa's offers fun, innovative cooking classes where you learn, prepare and enjoy meals together - kid free. We picked out a bottle of wine and headed off to Chef Alyssa's ready to don aprons and enjoy a much needed date night. My husband looks so cute in an apron ;) Chef Alyssa's is situated inside the trendy organic-friendly Atherton Mills Market that I've blogged about before here. The atmosphere is inviting, with stand up butcher block tables abutted by flat cook tops and all things kitchen supply at the ready. The kitchen has a cohesive upscale feel, I loved how they incorporated their business colors, lime green and blue into their decor, appliances and utensils. 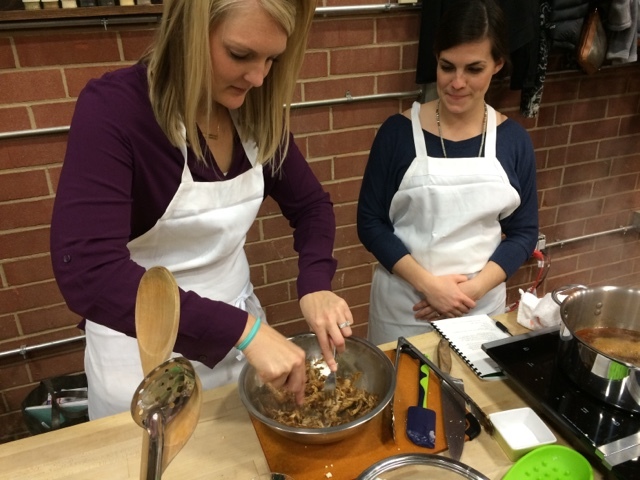 Andrew, their marketing and planning guru introduced us to Chef Alyssa, a home grown Charlottean. She's a local who keeps the produce and meats she uses locally-sourced, fresh and healthy. She started us off with delicious bolognese-topped sautéed veggie pasta - I'm going to be breaking out the Veggetti to make that tasty creation! 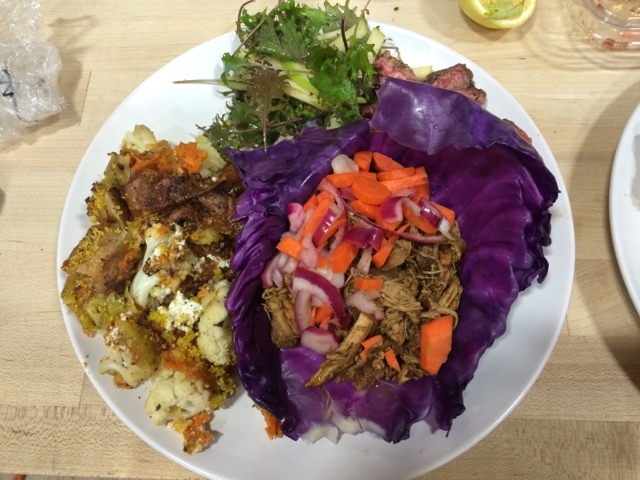 Here was our menu for Healthy Weeknight Meals. I'm not going to lie, when I first saw the list of meals I wasn't so sure how it would hit my palate. But I'm SO glad I stepped outside of my comfort zone of grilled chicken and baked potatoes and tried something new. 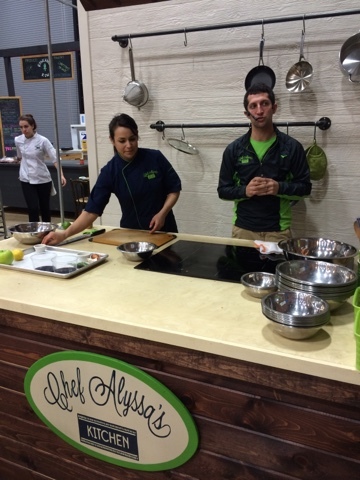 Each dish was delicious and Alyssa dropped some chef knowledge on us about some of the important cooking basics. For example, how to rock a chef knife to slice and dice, how to keep your onion in place for chopping, a secret to getting the juiciest steaks and how to incorporate coconut oil into your cooking as a healthier option. 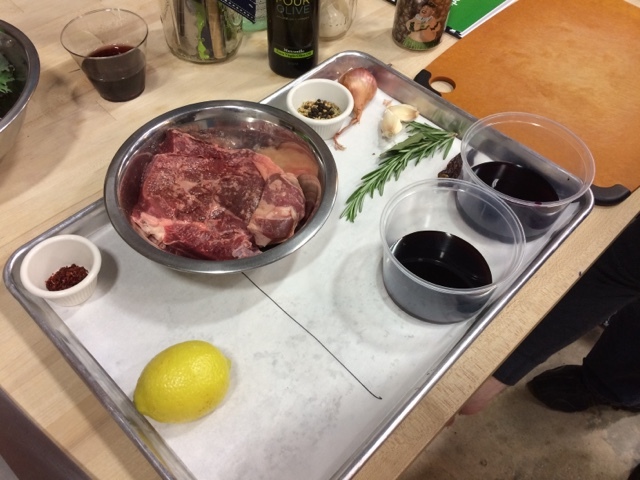 We prepared the marinade for our steak by toasting the spices and herbs and crushing them with the heavy skillet - not only was it aromatic it developed into a fully-flavored steak. We learned how to blanche purple cabbage that played the role as our crisp and tender taco shell. 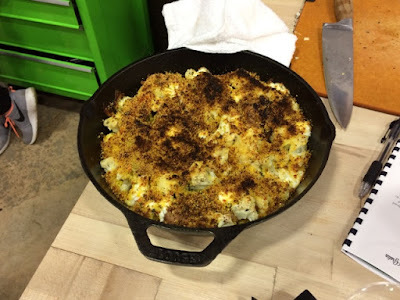 My absolutely favorite dish was the sweet potato and cauliflower gratin - I wasn't sure how those ingredients would meld together but WOW - it tasted more decadent than healthy! 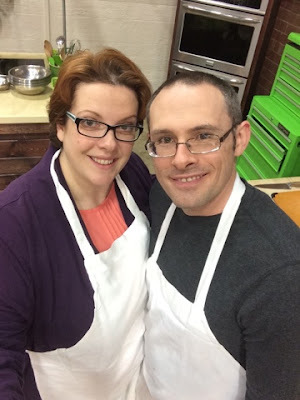 It was relaxing to sip on a glass of wine as my husband and I cooked and laughed together. We enjoy working as a team in the kitchen - but usually it's done under the dire circumstances of hungry impatient children. We really enjoyed ourselves, and both felt like we learned so many things that we didn't know about how to refine our cooking techniques to create tastier, healthier meals for each other and our family. 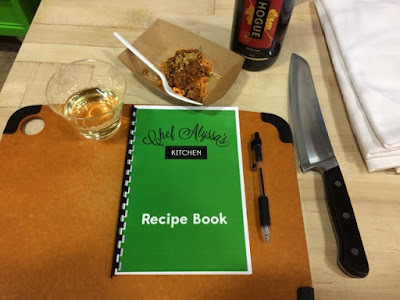 Chef Alyssa's Kitchen isn't only a great date night option, it's also a unique girl's night out, group or corporate event and they also offer summer camps. Their summer camp information is here and offered to kids ages 8-12 and 13-18. What a great gift to provide your kids with life-long kitchen skills! 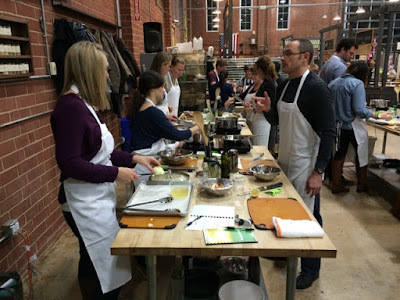 I enjoyed our experience so much that I'm putting together a neighborhood cooking event in a few months. 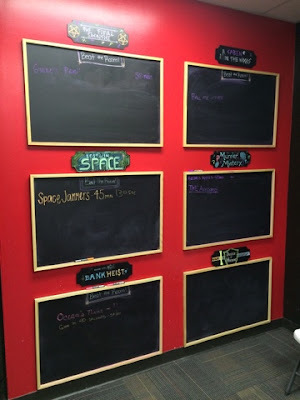 You can check out all of their classes here - they do book up quickly so if you see a class that fits your needs you'll want to snap it up. 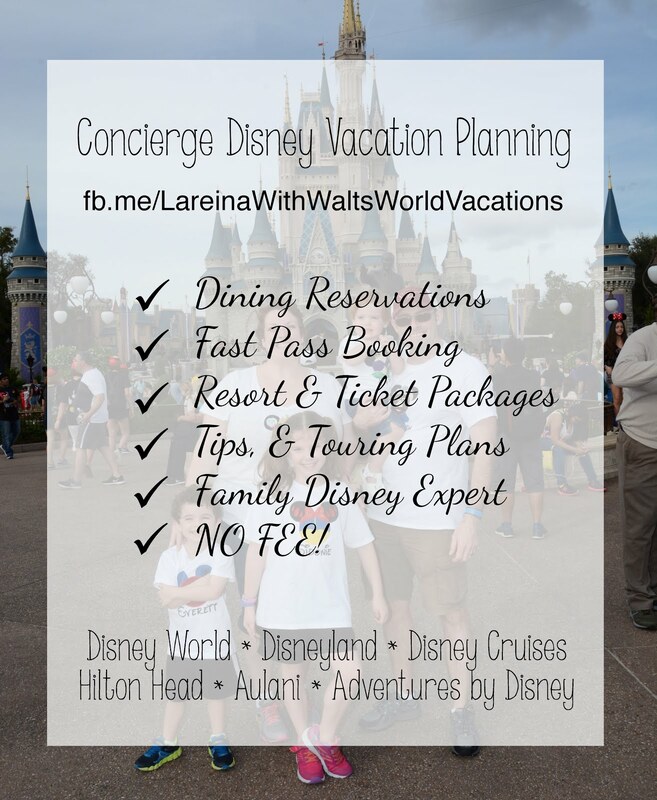 They range from $60 - $65 per person. Wine, Beer and appetizers are BYOB but they provide cups and water. Be sure to wear comfortable shoes because you will be on your feet as you cook. 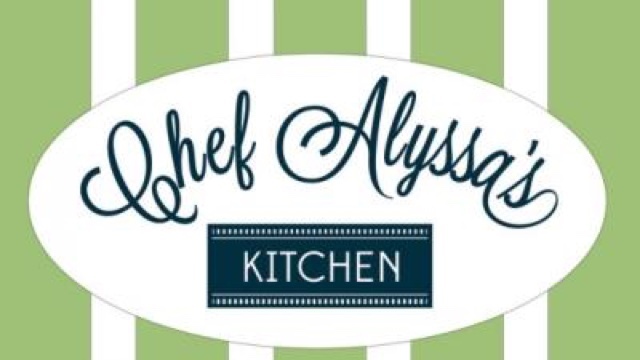 Keep up with what's cooking in Chef Alyssa's Kitchen by following them on Facebook, Instagram and Twitter! 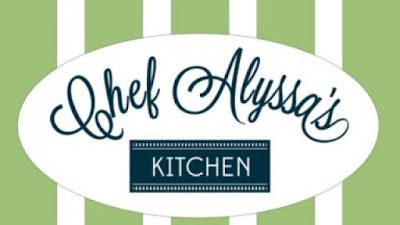 We were invited to participate at Chef Alyssa's Kitchen free of charge, but all opinions as always are my own. I only share what I love with my readers - and this experience was top-notch and I'm excited to share it with you.